And not only are they cute, you can hide treasure inside. They would look great as an accessory on a shelf or table around the house....or if you are a really good friend as the box to someone's gift. I'm not that nice I think I'm keeping these. I have a ton of that beautiful paper left over....I may try a tray or something. Decoupaging is so fun! Who knew!? I first cut the paper to fit the outside. Then modge it on. I did several coats. I'm guessing around 6. It dries pretty quickly. Then I gold leafed the edges. And voila! 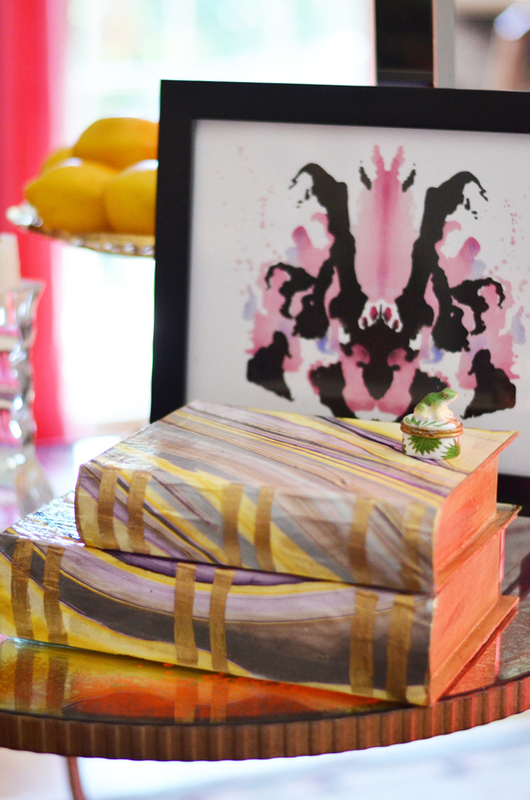 Wondering about that cute ink blot print in the background? Its Jessica's, from the Aestate. Get it here. Tags: book box, cardboard, decoupage, design, DIY, Joann, marble paper, Paprsource, The Aestate. So pretty and creative! I love the patterned paper! So pretty! 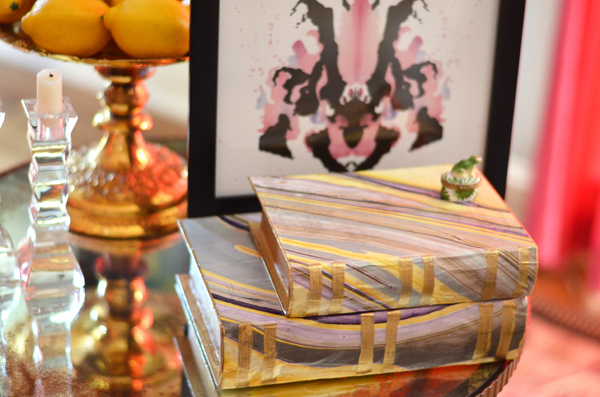 Love the gold leaf! how beautiful! I am so impressed! Me likes. Think I'll borrow this idea to wrap some photo albums for a project I'm prepping for. Thanks lady for the morning inspiration! Such a great project.... Btw... Love the print on the back! How fun! My mom and I were just talking about covering books...hehe. And this marbelized paper is really gorgeous! I've never seen a similar one in France... But I absolutely must find it or I'll check if papersource can ship to France. You are something - love the idea and it looks amazing!! wow- these came out looking so cool! And I love that print in the background! I've been considering buying the exact same one! those are FANTASTIC! I love how you did that! Wow that print in the background is super amazing. Seriously though, I LOVE this. The gold leaf pen is the perfect touch. I'm definitely doing this for my less-pretty books.